Alex Rider is really looking forward to going home. He has had more than enough excitement to last him for a long time. After all, how many fourteen year old boys end up going into space to save the world from a master criminal? After he splashes down in the Pacific Ocean and is taken to Australia Alex is sure that he will soon be back in London where he belongs. Alex quickly discovers, however, that one of the people working in the Australian Secret Intelligence Service (ASIS) has a proposal for him. Ethan Brooke wants Alex to go undercover posing as an Afghan refugee. Brooke wants to find out how one of the snakehead organizations is bringing refugees into Australia. The plan is that Alex and his adult partner, a man who calls himself Ash, will pay the snakehead to bring them into Australia and thus uncover their activities once and for all. At first Alex absolutely refuses to get involved. Then Brooke tells him that Ash is his godfather and was Alex's dead father's best friend. Alex knows so little about his parents that he jumps at this opportunity to find out more. Surely if he works with Ash, Ash will be willing to tell Alex about his mother and father, and perhaps he will even be able to explain why they were killed. And so Alex finds himself going to Bangkok and there he meets Ash. At first Ash doesn't tell him much about his father and mother, but later he tells Alex a great deal. Their mission hits snags almost at once. Alex is forced to take part in an illegal fight where hundreds of people bet on how long fighters will last against the champion. Alex defies the odds and beats the king of the ring. His furious captors do their best to kill him but Alex manages to escape. Soon after this dramatic event Alex meets up with his old 'friends' from MI6. They explain that they too are interested in the leader of the snakehead, a man called Major Yu. Apparently Major Yu is a member of Scorpia, the criminal organization which Alex has tangled with in the past, and Major Yu has stolen a super bomb from Britain. They want Alex to see if he can find the bomb before Major Yu decides to use it. So now Alex has two objectives; to find out how the snakehead organization operates and to find the missing bomb. What Alex does not know is that Major Yu knows who he is and the criminal genius has no intention of letting the boy achieve anything of importance. Will Alex be able to come out this encounter with Scorpia in one piece? 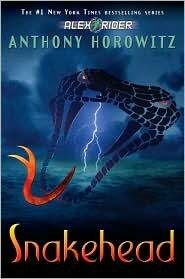 In this seventh book in the Alex Rider series Anthony Horowitz once again takes his fourteen year old hero on a roller coaster ride of adventure and misadventure. This time Alex not only has to defeat some formidable evil-doers, but he also tries to find a connection with his past, a connection which might end up being fatal for him. Cleverly crafted and highly entertaining from start to finish, this book is sure to delight readers who enjoy a good thriller.